The Infinity is a beautifully executed 2-button notch tuxedo, crafted in from a luxurious charcoal 150 thread-count fabric that is just excellent. The slim satin-edge lapels are a modern touch that our customers love. Available in Modern and Slim Fit. Turn it up to infinity with this extremely luxurious notch-lapel tuxedo jacket. It's crafted from a Super 150's fabric, a beautiful high-end fabric that is soft to the touch, and has a styling and fit that is sure to turn heads. This coat style is the same design as the Vera Wang rental tuxedo, but not with the $230.00 rental price tag. The tuxedo pants have no satin stripe running down the trouser leg. You can also mix it up with contrasting black pants in a pleated, flat front, or slim fit flat front cut. If you are looking to build a complete tuxedo ensemble using the Steel Grey Infinity, you can build a tuxedo and select this jacket as your preferred style option. The tuxbuilder will save you money on any complete rental package. 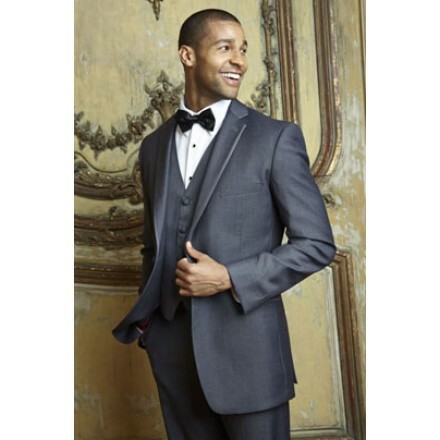 Here are some links to our other gray formal wear items that you can order for rental or purchase from National Tuxedo Rentals. Infinity in Heather Grey Tuxedo - This same tuxedo jacket but in a lighter grey color than the Steel Grey/Charcoal tux above. Fitzgerald Notch Tuxedo In Charcoal - Exact same color as the steel grey Infinity, but with all black satin lapels. Infinity Charcoal Tuxedo Pants - These pants match the Infinity Steel Grey / Charcoal tuxedo on this page. Shop Grey Formal Pants - All of our grey pants in one place to complete your tuxedo ensemble. Grey Tuxedo Shirts - For sale or rental, our complete selection of grey tuxedo shirts. Infinity Charcoal Vest - This grey vest matches the Infinity Charcoal / Steel grey tuxedo perfectly. Black and Charcoal Paisley Vest - The charcoal tapestry vest is a beautiful print featuring grey and black classic paisley patterns. 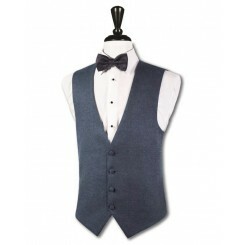 Gray Vests - we carry over twenty grey tuxedo vests in our catalog. Buy for immediate delivery or rent to arrive 7 days before use-date.